Ver Valley Walk 1 - The Source Walk at KensworthWalking RouteThe source of the River Ver is found at Kensworth Lynch. This circular walk explores the beautiful rolling countryside of this river valley. There is a choice of a long (6.7 miles) or short walk (4 miles). From the centre of Dunstable take the B489 then left at the roundabout - B4541. Another left turn - B4540 to Kensworth. Limited on road parking is available in the village. Please show consideration to residents. 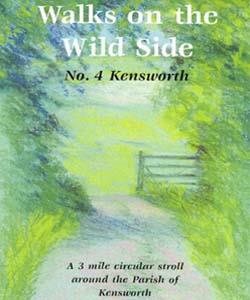 The leaflet describes the walk starting from Markyate in Hertfordshire. However, this is a circular walk so can be started from any point on the route, such as Common Road (the B4540), Kensworth, in Bedfordshire. The source of the River Ver is found at Kensworth Lynch. This circular walk explores the beautiful rolling countryside of this river valley. There is a choice of a long (6.7 miles) or short walk (4 miles).